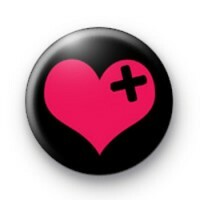 This is a listing for a black 1 inch metal pin badge with a super cute bright pink love heart in the middle. The love heart has a cut out black cross in the top corner. Hearts are the universal symbol of love so this badge would be great to give to that special someone.